All charges will be charged at the notified wherever mentioned in US Dollars, the same are to be collected in INRs at exchange rate (TT Selling) notified by STATE BANK OF INDIA, KAKINADA Branch on the day of vessel’s berthing/day of operation. When/if exchange rates are not available on Saturday, Sunday, Holidays the currency exchange rate on preceding day will be applicable. All central and state taxs which are applicable from time to time are in addition to the rates mentioned herein, unless specifically inclusion is mentioned. As and when long term contracts /special contracts entered with KSPL expire and the services are continued with mutual consent in which case the existing contract rates are chargeable till such time of mutually agreed rates comes into force. For those services under the contract which are also mentioned in the prevailing tariff are to be considered with reference to rates under the expired contract and prevailing tariff and the higher of the rates prevails till such time new mutually agreed rates comes into force. All charges are to be paid in advance and for any delayed payments beyond one week from date of invoice will be charged Interest @ 24% per Annum. (a) Under “Non Cargo Vessel” where ever a vessel calling for bunkers, fresh water, under water surveys, provisions, statutory clearances, crew change, landing sick person, to be treated as a normal call of any vessel dealt under Schedule-I(port dues/Schedule-II(Pilotage)/Schedule-II(Berth Hire & Schedule-VII(Wharfage). (b).“KDWP Main Jetty” means the 1910 Meters Quay wall with existing berths and other contiguous berths. 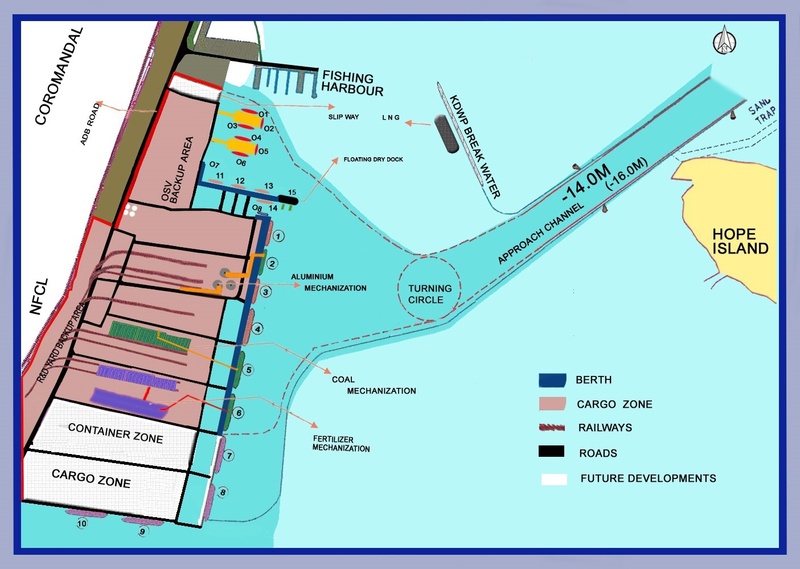 (c).“OSV jetties” means the Two finger jetties constructed north of KDWP main jetty along with OSV diaphragm wall next to finger Pier -2 & NRW Main Jetty berth. (d).“ NRW Multipurpose berth” – i) Unit-1: North ii) Unit-1: South iii)Unit-2 iv) Unit-3 are part of KDWP and operations at these berths to the extent of Cargo & OSV operations are governed by prevailing KSPL tariff. For any other operation the tariff is to be applicable as decided by KSPL. (e).“NRW Multipurpose Berth Extension Mooring Dolphins”: Two Mooring Dolphins East of NRW Multipurpose berth. (f).“R&D Yard” means the open yards on west side of ADB road in front of main gate being operated by KSPL. (g).“KDWP” means the port area encompassing KDWP Main Jetty, OSV Jetties, OSV diaphragm wall, NRW Multipurpose berth & along with extension mooring dolphins with associated backup area & R&D yards, berths, navigational channel & its anchorages. (h).Tariff applicable for vessels calling at KDWP for repairs at the repair terminal of NRW Multipurpose berth with extension mooring dolphins & Floating Dry-dock will be notified separately. (i).Tariff applicable for Mechanised handling of Coal & Fertilisers will be notified separately. (j).The tariff applicable for EXIM cargoes of Containers will be notified separately. I. The charges shall be collected on the gross tonnage (GT) and fraction of half a ton and more, being counted as one and less than half a ton neglected. In case of vessels having SBT, Reduced Gross Tonnage (RGT) as mentioned in Tonnage certificate is counted. II. Vessels entering in ballast shall be charged at 75% of the rates indicated above as otherwise applicable. III. Vessels entering the port for the purpose of repairs, bunkering and fresh Water but not discharging or taking in any cargo or passengers there in (with the exception of such un- Shipment and re-shipment as may be necessary for the purpose of repair) shall pay full Port dues as per the notified rates. IV. Port Dues are charged per call of vessel calling KDWP. V. Port Clearance amendment charges are Rs. 3,500/- per amendment.